It’s May the 4th. You know – May the Fourth! May the Fourth Be With You! Star Wars! Geddit? OK, fine. You have no time for popular culture – that’s why you’re reading ANBAD, trying to sniff out the odds and sods from the new music world. A bit like a tramp rummaging through a skip full of glass bottles, occasionally shaking a bottle that looks promising. 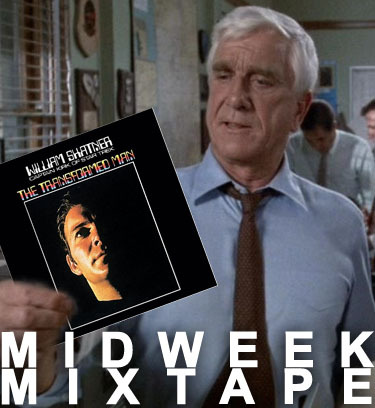 Lt. Drebin, by the way, gets wry pop culture references like the one above. He’s joining in by playing one of that movie’s greatest pop cultural spin-off… oh, wait. FIRST! Bronze’s song Horses may not actually touch on equine matters at all. It does have a recording from a spaceship, and astronauts are the new conquistadors, according to Ian Brown. They rode horses. Horses is the kind of nicely deft, quaint and sweet pop song that makes girls in the crowd melt a bit, and the boys begin to question if there’s more to life than football. Nice. SECOND! Apparently, the Hit Parade‘s There’s Something About Mary is entirely unconnected to the blockbuster movie of the same name. A happy coincidence, though, hey? The song itself is the kind of Indie that hasn’t been heard for years, and this song could quite happily have nestled betwixt the pages of a 1996 edition of Melody Maker. Maybe it really is time for that sound to come back. Endlessly cheerful stuff. FOURTH! Lost Harbours is actually a man called Richard Thompson. I’m fairly sure it’s not that Richard Thompson. There’s certainly not much hurdy-gurdy in the intriguing and minimal sound-collages that he makes, though perhaps that’s a good thing. Other-worldly and disorientating. FIFTH! People tell me that there’s not enough punk on ANBAD. So here’s Yer Beauties, with their Brand New Punk EP, which ought to keep everyone happy. Indeed, by the sounds of the gasping and clattering racket of Up The Rabble, this should cover ANBAD’s Punk Quota for the next six months. Smart. Posted on May 4, 2011 by Joe Sparrow. This entry was posted in Headline, Today's New Band. Bookmark the permalink.